Cue the FOMO alert, folks! Ever since taking over Netflix (and consequently, our hearts), the Stranger Things kiddos have had us fascinated. As in, we wish we could be our 12-year-old selves again so we could be BFFs with them and do things like, you know, eat tons of Eggo waffles or explore the Upside Down. Casual. And while that may not be possible in this universe, we’ll just have to live vicariously through Millie Bobby Brown’s friendship with her uber-talented costars. And speaking of which, the 13-year-old British star opened up to People about which of her pals from the show she’s grown into BFFL status with… and with whom she has weekly sleepovers! "Noah [Schnapp] comes almost every weekend for sleepovers," Millie told People of her costar, who plays the missing Will Byers. "We watch really scary movies on Netflix like The Babadook and Hush." 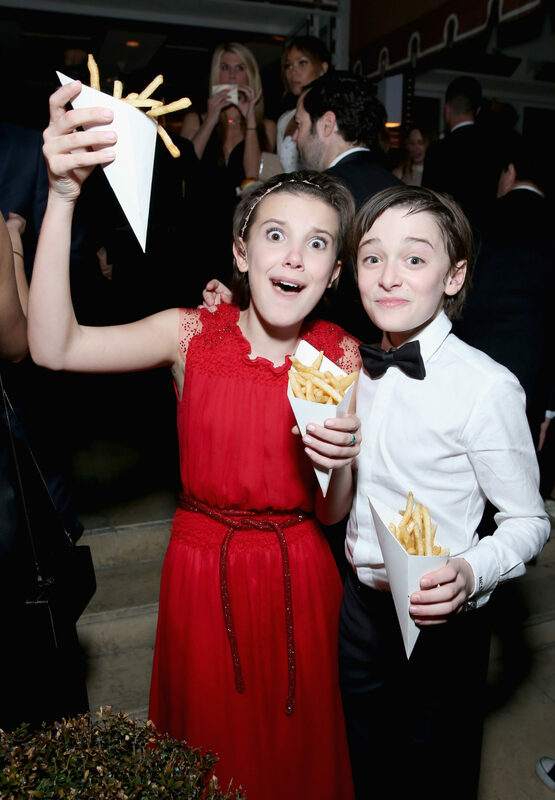 Well, we’d have to say it makes ~total~ sense that the IRL Eleven and Will would become besties. After all, their onscreen alter egos are the only ones who’ve experienced the Upside Down first hand, so we’d have to say that’s cause for some serious bonding! As for the other flicks Millie, Noah and the rest of the Stranger Things stars have watched together, the show’s creators have assigned them some ’80s movies to watch as ‘homework’ in the past. Because, really, how can you expect to play a proper ’80s kid without watching The Goonies, E.T., Jaws or Poltergeist? It’s just unthinkable! While the Stranger Things kids will no doubt be front and center promoting Season 2 of their hit Netflix original for a while, we won’t ~actually~ get to watch them in action until the show returns in full come October 31st. This coming season is top secret, and we can’t wait to see what they’re up to this time around!